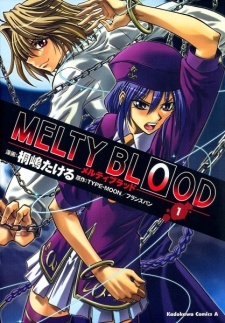 Based on the Doujin Fighting game, 'Melty Blood', made by the Doujin group, Watanabe Seisakujyo now known as French Bread. The story is one of two side-story sequels that occurs approximately a year after the good ending story of Arcueid's from the original Type-Moon game, Tsukihime. One year has passed since the "Serial Vampire Homicide case", that occurred in Tsukihime, was solved. But now the rumors of the serial murder are happening again and so once more Shiki Tohno patrols the city to find this phantom killer. While patrolling he meets and fights a mysterious woman by the name of Sion Eltnam Atlasia, member of the church group 'Alchemist of Atlas', who is in search of curing vampirism. But to do so she needs data from Arcueid, the last True Ancestor, to help her in her research. But this wont be easy as Ciel is also patrolling the city looking for the rumored killer, while Akiha has been acting strangely the past few days and also Arcueid hasn't been seen for awhile, could she be the killer...?